This post demonstrates the connectivity between VMware Cloud (VMC) on AWS and native AWS services. In the example below we will be using Amazon Elastic Load Balancing (ELB) to provide highly available, scaleable, and secure load balancing backed by virtual machines hosted in the VMware Cloud Software-Defined Data Centre (SDDC). There is an assumption you have a basic understanding of both platforms. When integrating with Amazon ELB there are 2 options: Application Load Balancer (ALB) which operates at the request layer (7), or Network Load Balancer (NLB) which operates at the connection layer (4). The Amazon Classic Load Balancer is for Amazon EC2 instances only. For assistance with choosing the correct type of load balancer review Details for Elastic Load Balancing Products and Product Comparisons. Amazon load balancers and their targets can be monitored using Amazon Cloud Watch. VMware Cloud on AWS links with your existing AWS account to provide access to native services. During provisioning a Cloud Formation template will grant AWS permissions using the Identity Access Management (IAM) service. This allows your VMC account to create and manage Elastic Network Interfaces (ENI) as well as auto-populate Virtual Private Cloud (VPC) route tables. An Elastic Network Interface (ENI) dedicated to each physical host connects the VMware Cloud to the corresponding Availability Zone in the native AWS VPC. There is no charge for data crossing the 25 Gbps ENI between the VMC VPC and the native AWS VPC, however it is worth remembering that data crossing Availability Zones is charged at $0.01 per GB (at the time of writing). An example architecture below shows a stretched cluster in VMware on AWS with web services running on virtual machines across multiple Availability Zones. The load balancer sits in the customers native AWS VPC and connects to the web servers using the ENI connectivity. Amazon’s DNS service Route 53 routes users accessing a custom domain to the web service. Remember to consider the placement of your target servers when deploying the Amazon load balancer. For more information see VMware Cloud on AWS Migration Planning. See also Elastic Load Balancing Pricing. Before configuring the ELB we need to make sure it can access the target servers. Log into the VMware on AWS Console, from the SDDCs tab locate the appropriate SDDC and click View Details. Select the Networking & Security tab, under Security click Gateway Firewall and Compute Gateway. In this example I have added a rule for inbound access to my web servers. The source is AWS Connected VPC Prefixes (this can be tied down to only allow access from the load balancer if required). The destination is a user defined group which contains the private IPv4 addresses for the web servers in VMC, and the allowed service is set to HTTP (TCP 80). If you are using the Application Load Balancer then you also need to consider the security group attached to the ALB. If the default group is not used, or the security group attached to the Elastic Network Interfaces has been changed, then you may need to make additional security group changes to allow traffic between the ALB and the ENIs. Review the Security Group Configuration section of Connecting VMware Cloud on AWS to EC2 Instances for more information. The Network Load Balancer does not use security groups. The gateway firewall rule outlined above will be needed regardless of the load balancer type. Log into the VMware on AWS Console, from the SDDCs tab locate the appropriate SDDC and click View Details. Select the Networking & Security tab. Under System click Connected VPC. Make a note of the AWS Account ID and the VPC ID. You will need to deploy the load balancer into this account and VPC. Log into the AWS Console and navigate to the EC2 service. Locate the Load Balancing header in the left hand navigation pane and click Load Balancers. Click Create Load Balancer. Select the load balancer type and click Create. Typically for HTTP/HTTPS the Application Load Balancer will be used. In this example since I want to deploy the load balancer to a single Availability Zone for testing I am using a Network Load Balancer, which can also have a dedicated Elastic (persistent public) IP. Enter the load balancer configuration. I am configuring an internet-facing load balancer with listeners on port 80 for HTTP traffic. Scroll down and specify the VPC and Availability Zones to use. 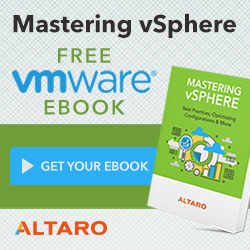 Ensure you use the VPC connected to your VMware on AWS VPC. In this example I have selected a subnet in the same Availability Zone as my VMware Cloud SDDC. In the routing section configure the target group which will contain the servers behind the load balancer. The target type needs to be IP. In this instance since I am creating a new target group I need to specify the IP addresses of the web servers which are VMs sitting in my VMC SDDC. The Network column needs to be set to Other private IP address. Once the load balancer and target group are configured review the settings and deploy. You can review the basic configuration, listeners, and monitoring by selecting the newly deployed load balancer. Click the Description tab to obtain the DNS name of the load balancer. You can add a CNAME to reference the load balancer using Amazon Route 53 or another DNS service. Finally, navigate to Target Groups. Here you can view the health status of your registered targets, and configure health checks, monitoring, and tags. This entry was posted in VMware Cloud on AWS and tagged AWS, ELB, VMware Cloud, VMware on AWS on March 5, 2019 by ESXsi. This post demonstrates the connectivity between VMware Cloud (VMC) on AWS and native AWS services. In the example below we will be using Amazon Elastic Compute Cloud (EC2) to provision a virtual instance backed by Amazon Elastic Block Store (EBS) storage. To complete the use case we will install Veeam and use the EC2 instance to backup virtual machines hosted in the VMware Cloud Software-Defined Data Centre (SDDC). The example architecture we will be using is shown below. For more information see VMware Cloud on AWS Migration Planning. AWS Security Groups will be attached to your EC2 instances and ENIs, it is therefore vital that you fully understand the concepts and configuration you are implementing. Please review Understanding AWS Security Groups with VMware Cloud on AWS by Brian Graf. In the AWS console Security Groups can be accessed from the EC2 service. In this example I have created a security group allowing all protocols (any port) inbound from the source CIDR block used in VMC for both my compute and management subnets. In other words this is allowing connectivity into the EC2 instance from VM in my VMC SDDC. You may want to lock this down to specific IP addresses or ports to provide a more secure operating model. Outbound access from the EC2 instance is defined as any IPv4 destination (0.0.0.0/0) on any port. I have also changed the default security group associated with the ENIs used by VMC to a custom security group. The security group allows inbound access on the ENI (which is inbound access to VMC as explained in the article below) on all ports from the source CIDR block of my native AWS VPC. Outbound access which is from VMC into AWS is defined as any IPv4 destination (0.0.0.0/0) on any port. Log into the VMware on AWS Console, from the SDDCs tab locate the appropriate SDDC and click View Details. Select the Networking & Security tab. Under System click Connected VPC. Make a note of the AWS Account ID and the VPC ID. You will need to deploy an EC2 instance into this account and VPC. Log into the AWS Console and navigate to the EC2 service. Launch an EC2 instance that meets the System Requirements for Veeam. In this example I have used the t2.medium instance and Microsoft Windows Server 2019 Base AMI. When configuring network the EC2 instance must be in the VPC connected to VMC. I have added an additional EBS volume for the backup repository using volume type General Purpose SSD (gp2). Ensure the security group selected or created allows the relevant access. In addition to security group settings inbound access also needs allowing on the VMC Gateway Firewall. In this instance as we are connecting the EC2 instance to the vCenter we define the rule on the Management Gateway. If we were connecting to a workload in one of the compute subnets the rule would be defined on the Compute Gateway. You may have noticed that although I allowed any port in the AWS Security Groups, the actual ports allowed can also be defined on the Gateway Firewall. In this example I have added a new user defined group which contains the private IPv4 address for the EC2 instance and added it as a source in the vCenter Inbound Rule. The allowed port is set to HTTPS (TCP 443) – I have also allowed ICMP. I have added the same source group to the ESXi Inbound Rule which allows Provisioning (TCP 902). 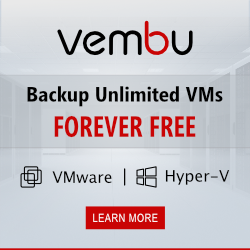 Both these rules are needed to allow Veeam to backup virtual machines in VMC. Now that connectivity between the EC2 instance and the VMC vCenter has been configured I can hop onto the EC2 instance and begin the setup of Veeam. I will, of course, need an inbound rule for RDP (TCP 3389) adding to the security group of the EC2 instance, specifying the source I am connecting from. Follow the installation steps outlined in the Veeam Backup & Replication 9.5 Update 4 User Guide for VMware vSphere. In the VMC console navigate to the Settings tab of the SDDC and make a note of the password for the cloudadmin@vmc.local account. Open the Veeam Backup & Replication console and add the vCenter private IP address, use the vCenter cloud admin credentials. Add the backup repository using the EBS volume and create a backup job as normal. Refer to the Veeam Backup Guide if you need assistance with Veeam. To make use of S3 object storage AWS you will need an IAM Role granting S3 access, and an S3 VPC Endpoint. In the case of VMC, as an alternative design, you can host the Veeam B&R server inside your VMC SDDC to make use of the built in S3 endpoint. In testing we found backup speeds to be faster but you will likely still need an EBS backed EC2 instance for your backup repository. It goes without saying you should make sure backup data is not held solely on the same physical site as the servers you are backing up. See Veeam KB2414: VMware Cloud on AWS Support for further details. Add a new Scale-Out Backup Repository and follow the steps to add account and bucket details. Set an appropriate policy for moving backups to object based storage, once this threshold is met you will start to see Veeam files populating the S3 bucket. This entry was posted in VMware Cloud on AWS and tagged AWS, EC2, VMware, VMware on AWS on February 20, 2019 by ESXsi.